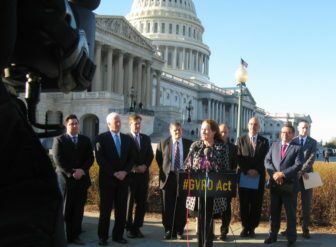 Rep. Elizabeth Esty, D-5th District, discusses gun violence legislation in front of the U.S. Capitol Tuesday. Washington – Connecticut has had a “red flag” law for years, but after the Parkland, Fla., school shooting, some in Congress think other states should be prodded to allow authorities to remove guns, at least temporarily, from those who may be a danger to themselves or others. Connecticut’s red flag law, enacted in 1999 and the first in the nation, allows two law enforcement officers, or one state’s attorney, to petition a court for a firearms restraining order. Nearly a year ago, Esty co-sponsored the Gun Violence Restraining Order Act, legislation that would provide federal grants to states that enacted red flag laws. But, along with dozens of other House bills aimed at tightening gun laws, Esty’s bill has not had a hearing, much less a House vote. She is hoping for some help from the White House to finally get congressional action on the bill. Esty and Sen. Chris Murphy are among a small group of lawmakers who have been invited to meet with President Donald Trump Wednesday to discuss ways to battle gun violence. Esty said she will ask Trump to back her effort to provide incentives to states to implement what are known as “red flag laws,” and other gun legislation. “I will be looking closely at what he is willing to do, what he is willing to step up for and what he can get behind,” Esty said. Red flag laws have come into recent focus because of reports that 19-year-old Nikolas Cruz had frequently displayed disturbing behavior, but Florida had no red flag law that would take away his weapons. Mark Barden, a founder of Sandy Hook Promise who lost his 7-year-old son Daniel in the Newtown massacre, joined Esty and other lawmakers Tuesday at a press conference on the U.S. Capitol grounds to promote the Gun Violence Restraining Order Act. Sen. Dianne Feinstein, D-Calif, has introduced a companion bill in the Senate. “Only a handful of states have a legal process to take those guns away, while the vast majority of states leave families with little recourse if they fear their loved ones want to hurt themselves or others,” Feinstein said. Gun bills are facing the usual resistance in Congress despite the Parkland shooting and the new student-led campaign demanding action. Even the ‘Fix NICS’ bill sponsored by Murphy and Sen. John Cornyn, R-Texas, which is backed by Trump and would provide incentives for states to submit more records to the gun buyer background check system, is in trouble. A Senate effort to fast-track the Fix NICS bill was blocked Monday night by Sen. Mike Lee, R-Utah. Meanwhile, House Speaker Paul Ryan and other House GOP leaders on Tuesday downplayed the need for Congress to pass expansive new gun control measures, instead criticizing the FBI and local law enforcement for failing to prevent the Parkland shooting. As far as the Fix NICS bill, Ryan said the House already had passed the legislation and it’s up to the Senate to act. The problem is that the Fix NICS bill that passed the House was attached to a concealed-carry bill that would allow someone who has permission to carry a concealed weapon in one state to carry it in every other state. That concealed-carry provision will not pass the Senate, and Ryan has promised GOP conservatives he would not split it from the Fix NICS bill. Still, Esty, and other gun control advocates, cite increased public support for some gun bills, including one that would extend FBI background checks of gun buyers to individual sales at gun shows and over the internet. The advocates say the new student movement that sprang from the Parkland shooting keep the issue of gun violence from fading away, as it usually does after every mass murder. “The children of America stopped the war in Vietnam, and they can stop this,” Esty sai. Gun control advocates also say there is renewed interest among states in red flag laws, which are now in place in a handful of states besides Connecticut, but are suddenly moving forward in others, including Maryland and Florida. The legislation promoted in Congress by Esty and others would encourage states to go further than Connecticut does, and allow family members and friends and roommates to petition a court to remove weapons from someone who poses a threat to himself or others. Esty said Connecticut’s General Assembly might want to strengthen its red flag law. “I think Connecticut could look to broaden it,” she said.